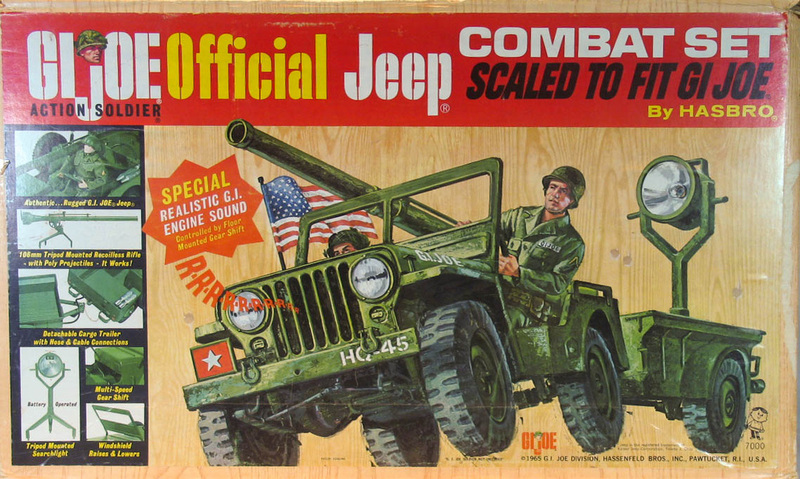 There are lots of variations and information to be found about the Jeep, GI Joe's most popular vehicle. 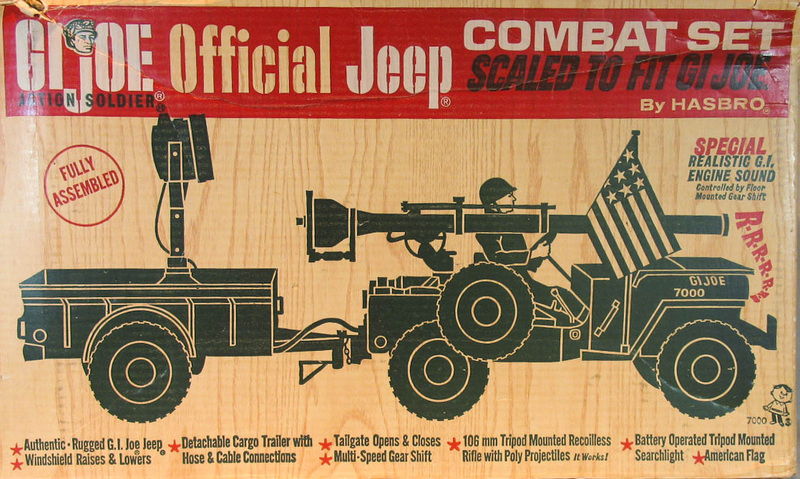 The jeep and trailer are shown in the spins above and below. The set is also known as the "Five Star Jeep." 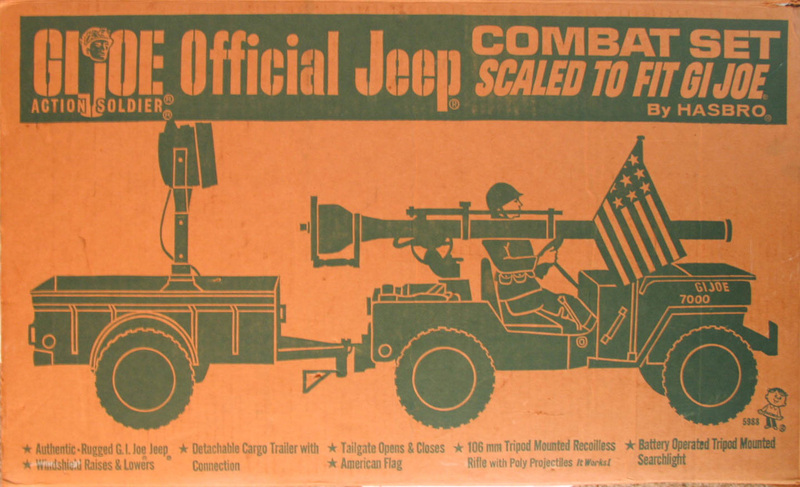 Hasbro also made a tan version patterned after the one on The Rat Patrol television show called the Desert Patrol Attack Jeep. Early versions had a noisemaking action called 'moto rev' whose intensity could be controlled by the gear shift lever. By the mid-60s that had disappeared, though the spring loaded recoilless rifle could still launch poly plastic shells well into the 70s. 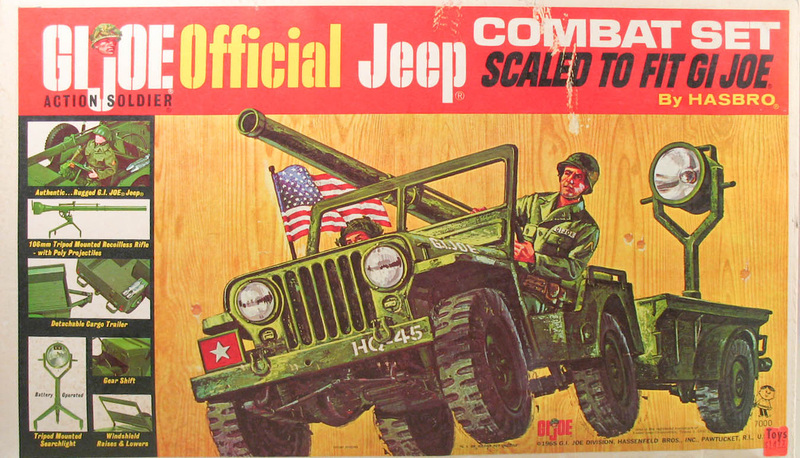 Like the original footlocker, the Combat Jeep maintained its military look almost to the end of the 12" line, and was sold alongside more civilian models like the Desert Patrol Adventure and Sandstorm Survival jeeps. The first issue "moto-rev' version box. 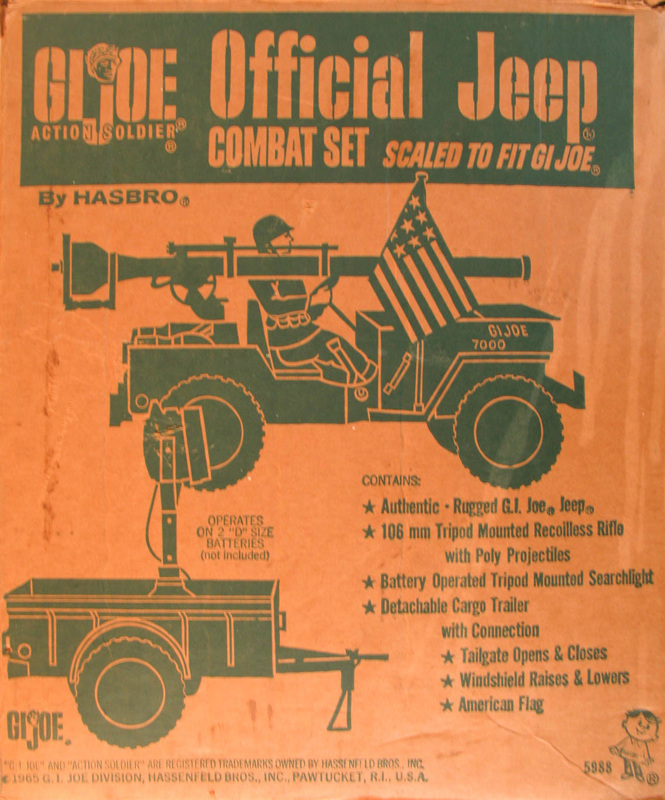 The first issue version can occasionally be found with "As seen on TV" added to the box art. This image (below) courtesy of eBay seller ottiefarm. See their auctions here. This version is found on a plain white box. Right, the side panel from the later box. Note the change to the description of the recoilless rifle. Where the first version follows 'Poly Projectiles' with the phrase 'It Works!' this later release version was apparently intended to come with a non-working version of the spring loaded weapon, as the last two words are blacked out. The working version's spring and trigger are shown above. It is unclear when this change was was made. 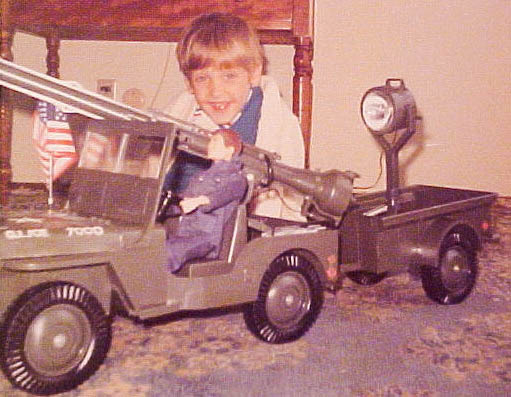 My childhood jeep (see pictures below) was purchased for me in 1972 and had the working cannon. 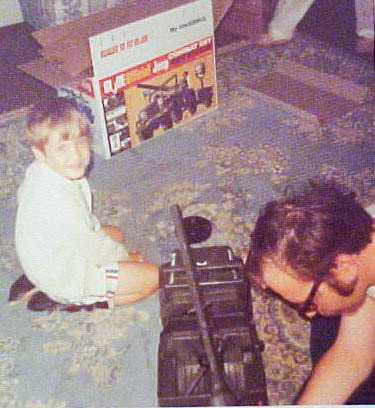 To make matters even more unclear, the set shown in the pictures here has apparently unused contents and all the inserts, and contains the working version of the gun even though the 'It works!' is not on the box. 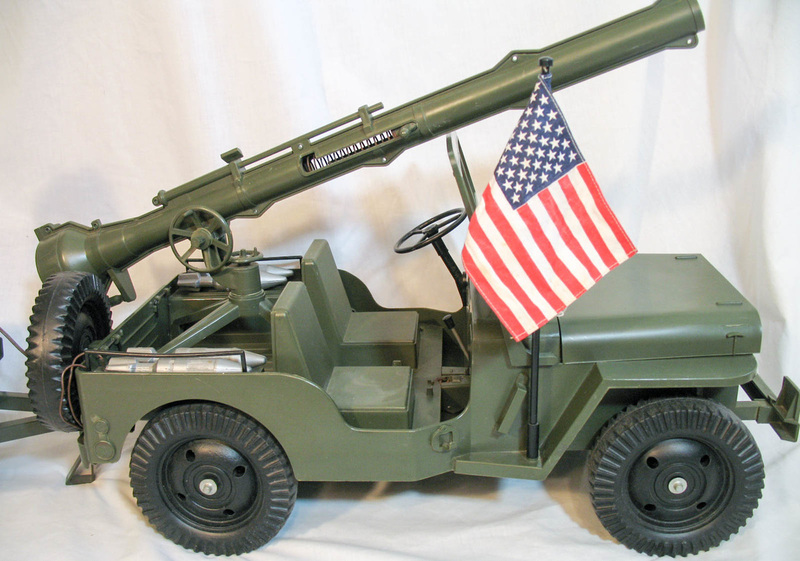 The only non-working version of the cannon I have is shown below, and that one came with the late issue 1976 Combat Jeep Vehicle, which is an entirely different item in many respects. Note the grayer shade of green plastic and the glued rather than riveted construction. 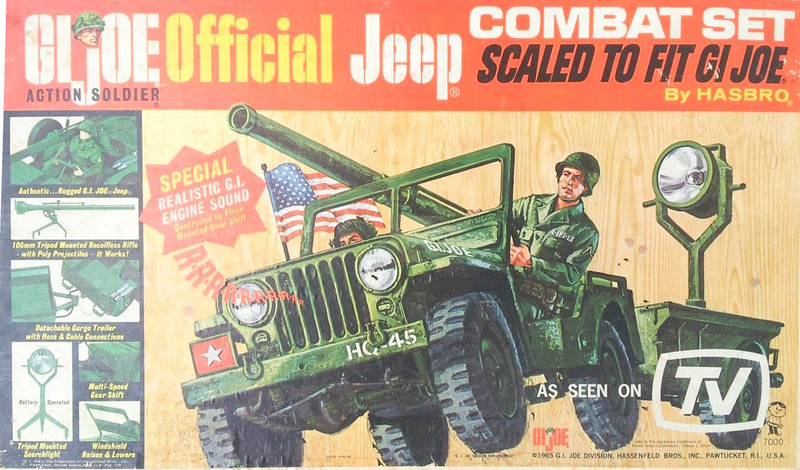 Sears sold the jeep as an "exclusive" that actually had fewer features: no moto-rev, no hubcaps, and sometimes no paint details. These can be found in standard boxes with the color litho, and in a plain brown box with the design printed on it. Note the subtle changes between this art and the art from the back of the first issue box above. 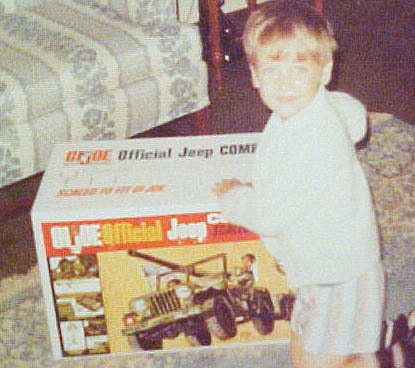 Enjoy these pics of me getting my first jeep, and my dad helping set it up. Nice sideburns, Dad! These were taken in spring or summer of 1972. If you have any pictures of yourself playing with a favorite set and would like to share them, contact me!